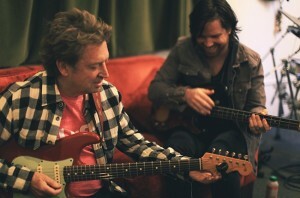 “I’ve been through the whole thing you can do with a rock band,” says Andy Summers. He’s not kidding. Even before joining The Police, the guitarist had jammed with Jimi Hendrix in L.A. and with Eric Clapton in London, recorded a crossover album with an orchestra of Hungarian refugees in Munich, broken his nose in a tour-van crash in Yorkshire, thrown up on Richard Branson’s Persian rug after celebrating a record deal and had a tour manager kidnapped by yakuza promoters in Japan. And now, at 72, after playing psych-rock, prog-rock, pub-rock and The Police’s 2007-08 reunion jaunt — the seventh-highest-grossing tour ever — he’s started a new band. With reunion tours now de rigueur for every outfit with even a minor hit in Mongolia, the true measure of rock ’n’ roll lifers is their willingness to stay musically hungry. Circa Zero, Summers’s new duo with singer/bassist/drummer Rob Giles, drop their debut album, Circus Hero, this week on 429 Records, and Summers is enthused: “It’s all about the music for me,” he says, and laughs: “That’s what everyone says.” But it would appear he’s genuine. Both he and fellow ex-Policeman, Sting, who has been sharing stages and backing musicians with Paul Simon, are helping maintain the idea that in this age of studio projects, bands themselves, as uneasy democracies, aren’t simply nostalgic endeavours. © 2014 Circa Zero. All Rights Reserved.